This arrived exactly as the picture showed online. 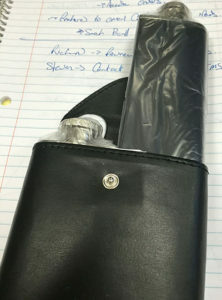 It’s decent quality leather, well put together, and the flasks are about the size I had pictured. They are sturdy, look like they will hold up well, and everything looks new and shiny. 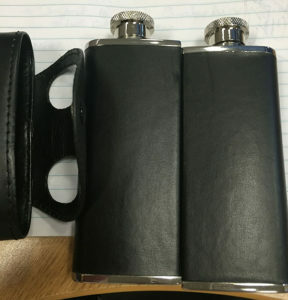 The two flasks fit quite snugly in the leather, which means there isn’t a lot of jingling and wiggling around when in motion. It does make them slightly difficult to pull out individually, but that’s a small price to pay. Each side holds just slightly over 3oz, and if you can’t tell from the pictures, the tops aren’t attached, so just be aware of that when you’re taking them off and leaving them sitting around. All around, excellent product, would buy again. I’ve been looking for a flask for a while now. I do quite a bit of travelling and having to wrap and pack a bottle of scotch in my suitcase just for one nightcap is kind of risky, and it takes up a lot of space. When I found this set, I knew I would have to buy them, not only were they more than reasonably priced (~$29 CDN) but they were something I’d never seen before. Which is one of the things I specifically seek when buying a “luxury” item for myself. The shipping from Overstock was almost as much as the flask, but at ~$53 (everything included), I still felt it was a bargain. Having two flasks for the price of one was a great bargain for me in particular. Since I’m only packing liquor for myself for a few days at a time, this gives me a variety, without carrying too much extra, or having two larger flasks only half full. Or you know, filling two flasks all the way and twisting my own arm and maybe drinking a bit “too much” on my business trips. I was super excited when it arrived, which took longer than most things I order online (around 2 weeks) but in the scheme of things, not too long. I was aware when I ordered that it would be a bit of a wait, so not a surprise. 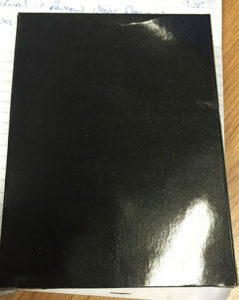 I tore in to the package right away, and was greeted with a quite plain black box. Nothing fancy, which is pretty much what I expected all told. Inside the box was the dual flasks, each wrapped for their own protection. I stripped everything off and played with them for a while. I took a minute to test the capacity (and wash them out), and to test putting them in and out of the pouch a few times. It’s hard to guage size online, these are a bit larger than a standard flash, about an inch taller and just slightly wider (both together). 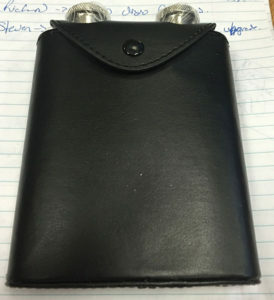 Which makes sense since each one is around 3oz capacity, and a standard flask is around 5oz total. These won’t fit nicely in your shirt pocket, but will travel well in a small carry-on. For my first flask purchase, it’s fantastic and I have no regrets.